Jakob Fuglsang outshone Chris Froome and Richie Porte to win the final stage of the Critérium du Dauphiné to claim overall victory. 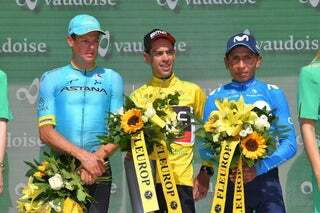 BONNEVILLE, France (AFP) — Astana’s Danish rider Jakob Fuglsang outshone defending champion Chris Froome and Australian Richie Porte to win the final stage of the Critérium du Dauphiné to claim overall victory on Sunday. Fuglsang, a silver medallist in the road race event at last year’s Rio Olympics, went into the stage in third place. But he managed to overhaul his rivals on a gruelling mountain ride, 115km long over three cols (Saisies, Aravis, Colombiere) before a final climb to the finish line at the Plateau de Solaison, high in the Alps. Fuglsang and Ireland’s Dan Martin attacked in the final 7km to set up the 32-year-old Dane’s second stage win in three days to claim the overall title. Fuglsang soloed to the stage win, finishing 12 seconds ahead of Martin. Crucially, overnight leader Porte was 1 minute 15 seconds off the pace and Froome, who started the ride in second, a further 21 seconds adrift. Fuglsang’s victory meant he leapfrogged Porte in the overall standings, the Australian claiming second at 10 sec0nds with Martin rounding out the podium by 1 second over Froome, the three-time Tour de France winner. “It’s amazing! I don’t know what to say. Even with jersey I can’t believe it, I’ve been close to the yellow jersey many times in my career,” Fuglsang said, dedicating the win to his pregnant wife. “We tried to keep our positions on GC and it came down to a big big fight for the overall victory. “We planned it very well with Fabio (Aru) attacking (with Alejandro Valverde in the col de la Colombiere) and everything went in our favour. The Dane said the victory was a warning shot at rival teams for the July 1-23 Tour de France.